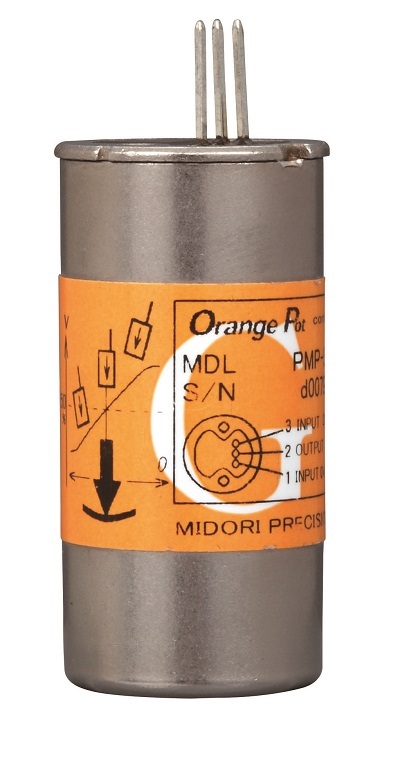 Orange Pot is the general term that Midori has used for the Hall-IC contactless potentiometer. It is identified by orange-colored nameplate attached to the part. 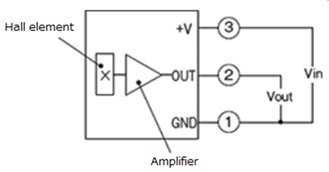 Hall-IC has combined the Hall-element and amplifier for amplifying the electrical potential change caused by the Hall effect principle. 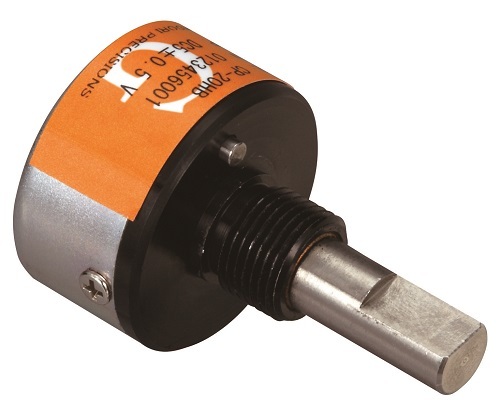 In comparing the Orange Pot to the other contactless potentiometers such as the Hall-element sensors or magnetoresistive element sensors, output voltage range of the Orange Pot is wider. 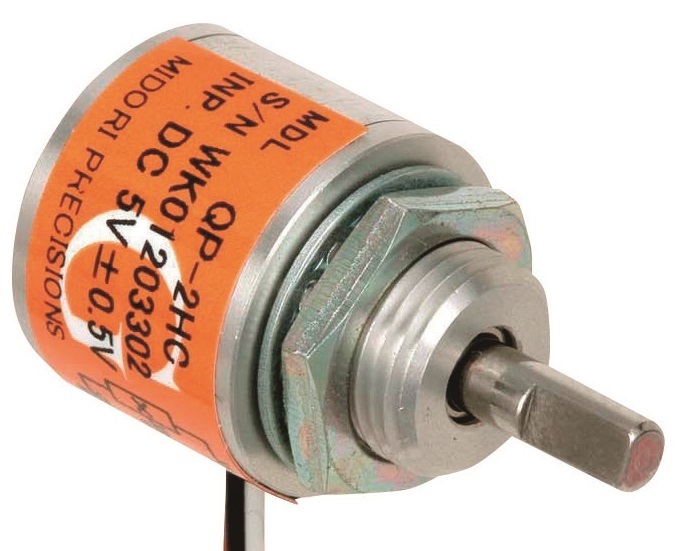 Moreover, since temperature compensating circuit was built into the IC, the temperature drift is smaller than any other contactless potentiometers. Due to contactless design, there are no sliding contacts between the magnet and Hall-IC. Therefore, there is no electrical noise in the output regardless of the displacement velocity (except for disturbance noise). Output voltage range is wider than that of the conventional Hall-element sensors or Magneto Resistive element sensors. Small temperature drifts due to the built-in temperature compensating circuit. 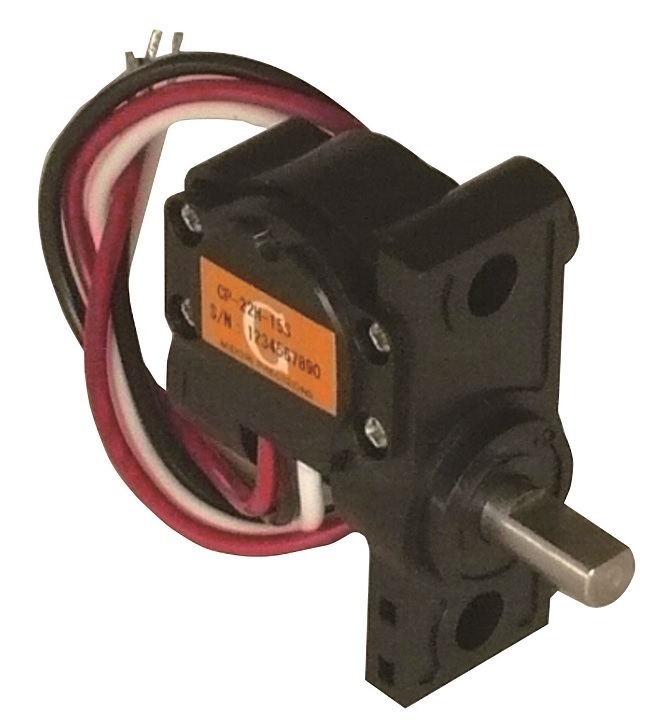 Shaft torque and friction are very small due to the contactless design. There is no mechanical friction between the parts except at the shaft bearing. As the result, Orange Pot has superb long life. The use of integrated-circuit as electrical components can reduce the number of parts and make it easy in miniaturizing and mass producing parts. (1) Create output voltage change by rotating a magnet near the Hall-IC. (2)Create output voltage change by moving the magnet horizontally near the Hall-IC. Hall-IC is composed of an integrated combination of Hall element, amplifier, and temperature compensating circuit. The operating principle of Hall-IC is creating amplified output voltage to deflect the direction of electric currents by the magnetic field. Place a Hall-IC on the side of a semicircular magnet to detect magnetic field change in the radial direction. Hall-IC’s output is programmable to the correct linearity and output sensitivity. By programing the output, it is feasible to set up particular effective electrical travel and also output range. Hall-IC in Orange Pot is locked before shipment; therefore, the end user shall not be able to change the program after shipment. Hall-IC has output resolution that is unlike MR-element. 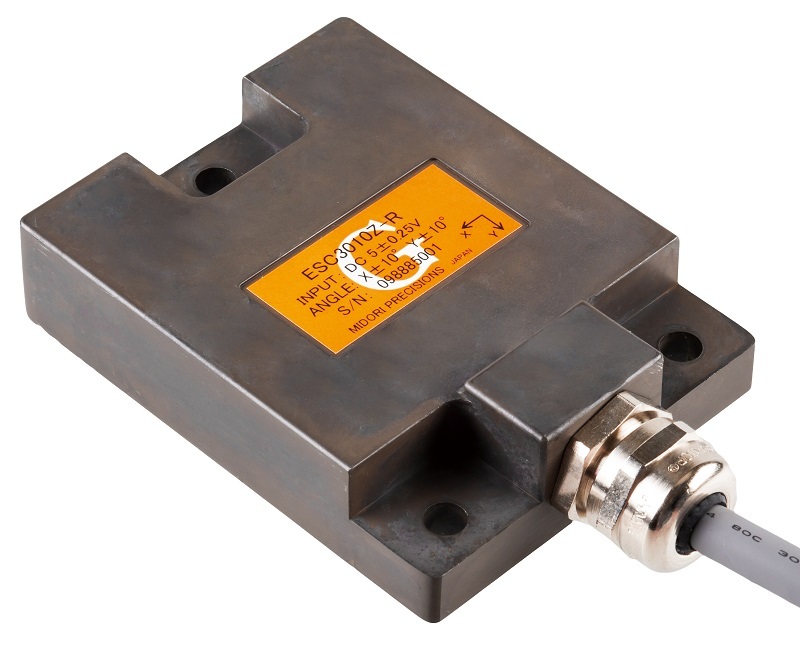 Orange Pot products use the Hall-IC that has output resolution of more than 12bit (/Vin). Hall-element can easily be affected by ambient temperature. As the result, the integrated IC would compensate output characteristic within a preset temperature range in the IC. •Insert threaded part of pot through from the back side of mounting board and fasten the pot by a nut with washer. •Be sure to place a washer behind of the nut. •As for the pot with a stopper pin, make a hole for a stopper pin on a mounting board. •Do not rotate the pot itself when tightening the nut. This may cause malfunction of the sensor. •Do not over tighten the nut. This may damage the threaded part of the pot. •In case of installing the pot at places where there is a lot of vibration, the mounting screws can be locked by adhesive. •Fasten the pot with screws into the tapped holes which is on the mounting surface of the Pot. •Please use certain length of screw. •In case of selecting mounting method ‘B1’, create a shaft hole on the mounting board which diameter is larger than the pot shaft diameter. •Install a pot on the mounting board using mounting cleats . •Make hole to fit diameter of matching flange. •Do not tighten the screws for the mounting cleats until pot body is fixed at the desired position. •Gears or couplings on the shaft smaller than diameter of mounting hole may be more convenient for installation. 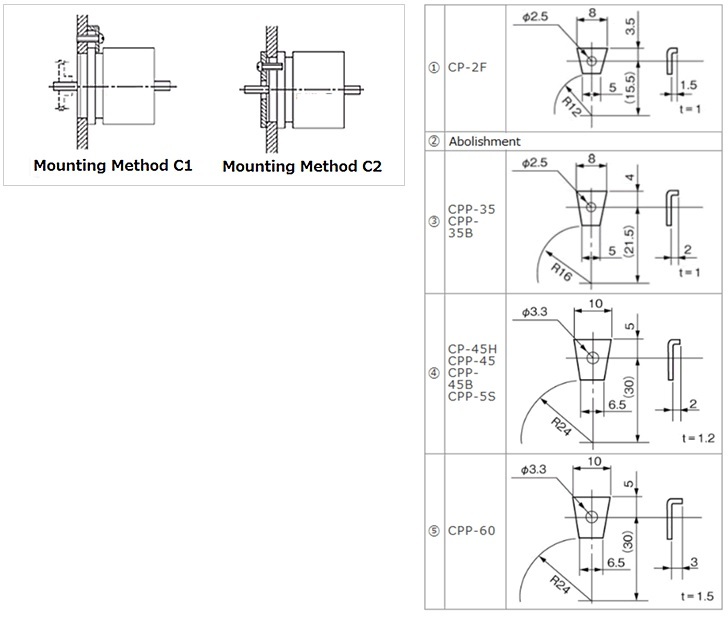 •In case of using mounting method ‘C1’, place a few mounting cleats equally spaced by mounting hole. •If there is no space to place the mounting cleats, it is recommended to use mounting method ‘C2’. Resistance value of Orange Pot is not measurable because Hall-IC contains a built-in operational amplifier. As the result, please make sure to measure the output voltage of pot with the prescribed input voltage. Because Orange Pot uses CMOS IC, it has the characteristic of being sensitive to static discharge. Please consider the followings in handling Orange Pot products. 1. During installation or replacement of Orange Pot, keep eliminating static electricity by using static erasers. 2. Make sure static electricity is eliminated from your body before handling Orange Pot. 3. Do not touch the tip of the sensor cable by hand. 4. Before installing Orange Pot on the equipment, create equipotential between equipment and sensor body. 5. 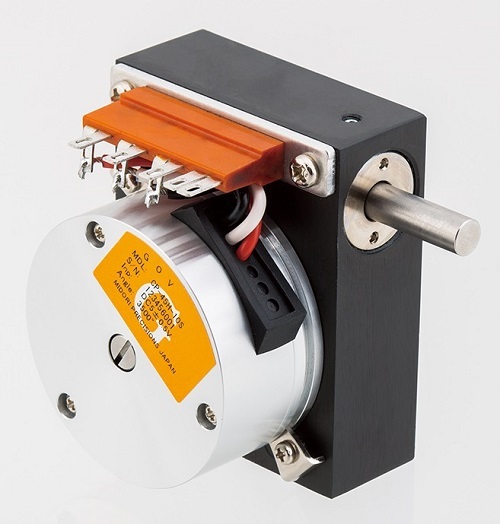 It is recommended that the end user creates equipotential between mounting portion of Orange Pot and power supply chassis. 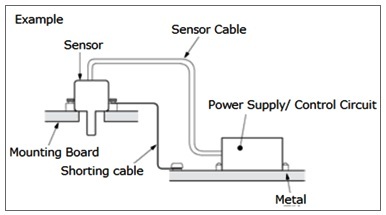 If sensor body and mounting board are metal and mounting board is connected to earth or GND, it is seen as less influenced by static electricity. 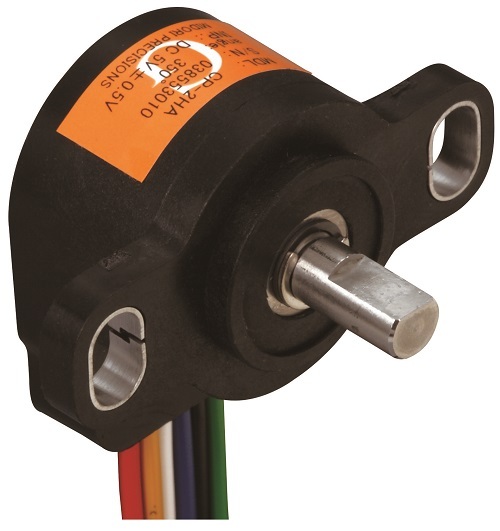 However, if the sensor is installed in the area where it is not connected with the earth or if mounting portion is isolated by resins, static electricity will charge on the sensor shaft and body depending on sensor usage and this will be a factor in malfunctioning the sensor. 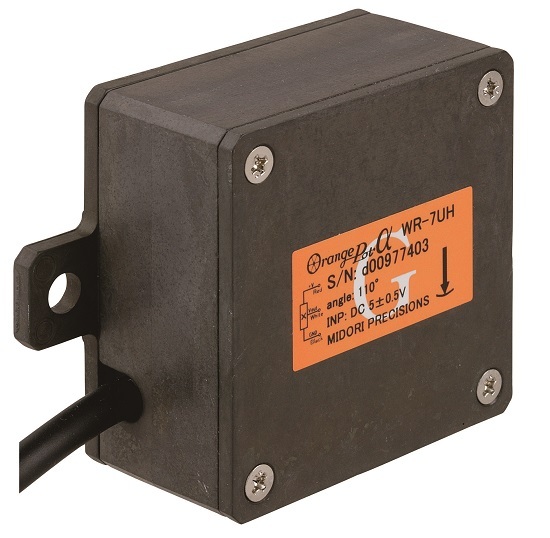 If metal body sensor is used, avoid static electricity discharge into the sensor by connecting the sensor fixing screw to the earth or GND. 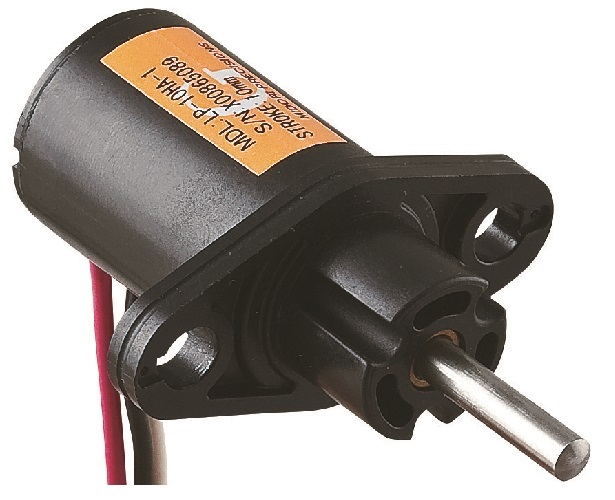 If plastic (resins) body sensor is used, sufficient consideration is required to avoid discharge of static electricity from metal sensor shaft. The Hall-IC used in Orange Pot α is equipped with a self-diagnosis function. 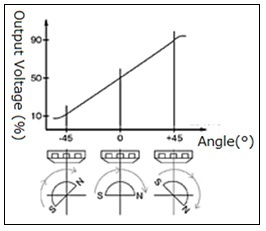 In applying input power, voltage Vin must rise to 4.5V within 0.2 second; otherwise, output shall be disabled (Vout = 0V) for activating the self-diagnosis function. To restart Orange Pot, reset the power or change to the short start up time circuit. 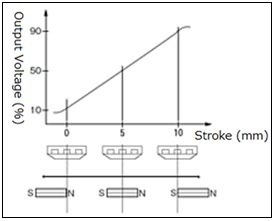 If load resistance is small, it has an effect on the absolute lineaity. Potentiometers are precisely assembled and adjusted. Please handle them carefully as a precision device. •Do not disassembling the pot. •Do not drop the Pot. •Do not apply excessive voltage or current. •make sure to use digital tester. •Mount without tapping or squeezing into a panel. •Use wire that has sufficient length for connection terminals. •Use wire less than 0.3mm2 (AWG22) in cross section. •Be sure to connect appropriately. •Do not apply voltage on output terminals. •Solder no more than 5 seconds at 300°C MAX. •Do not apply excessive torque to the mechanical stopper of rotary type pot. •Do not immerse in water or pour water or chemicals on the pot. •Observe precautions for handling electrostatic discharge sensitive devices. Do not store pot in the following conditions. – Place where salinity or corrosive gases are present. The units in the web site is the International System of Units (SI). satellite, and medical devices, please contact us before purchasing. 2. Environmental specifications that are indicated on this web catalog are guaranteed based on the test conditions established by our company. It is not guaranteed the performance in actual use. When making a decision to adopt our products, please be sure to examine the products by mounting and testing them beforehand at your own risk. 3. Although specifications and handling instructions of each products were offered in this web catalog, the function may be limited depending on the handling conditions. When making a decision to adopt our products, please obtain detailed documentations of the products from us. 4. As a principle, we can not provide compensation for any damages to the customer’s equipment or device caused by the breakdown or malfunction of our products. 5. Our products are electronics components. Repair or replacement is not supported except some of the products. 6. We do not accept any returns or exchanges for the product. Please carefully check the specifications of the product before placing an order. 7. The content of this website is subject to change without notice for the sake of improvement. 8. Please contact the sales department if you have any questions or concerns. The information in this web catalog is subject to change without prior notice.